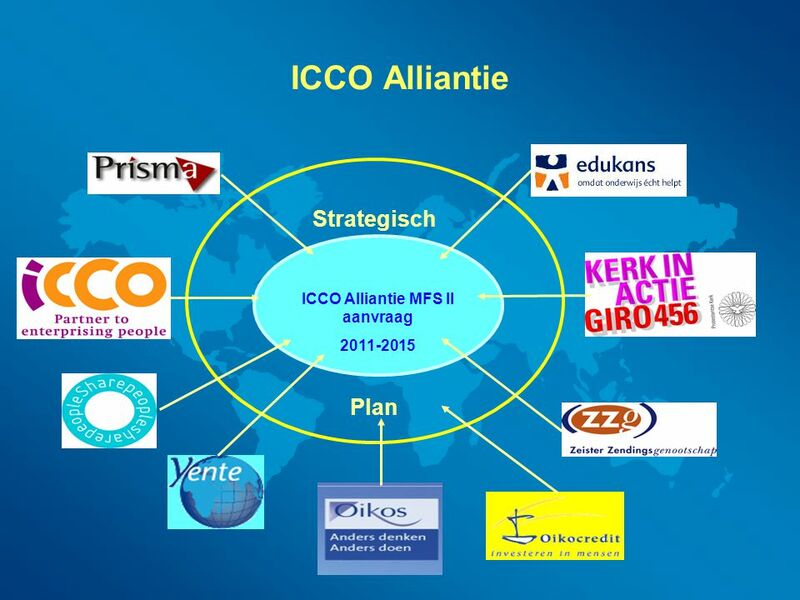 Strategisch Plan ICCO Alliantie MFS II aanvraag ICCO Alliance started in 2005 with 6 members: Edukans, ICCO, Kerk in Actie, Oikocredit, Prisma, Share People In other members joined: Yente – network of female entrepreneurs for female entrepreneurs ZZg – Zeister Zendingsgenootschap (since 1793) is related to the Moravian church and mainly working in Surinam and Tanzania; Oikos – ecumenical organization promoting change in the Netherlands; All 9 members participate in the creation of the strategic plan of the Alliance. 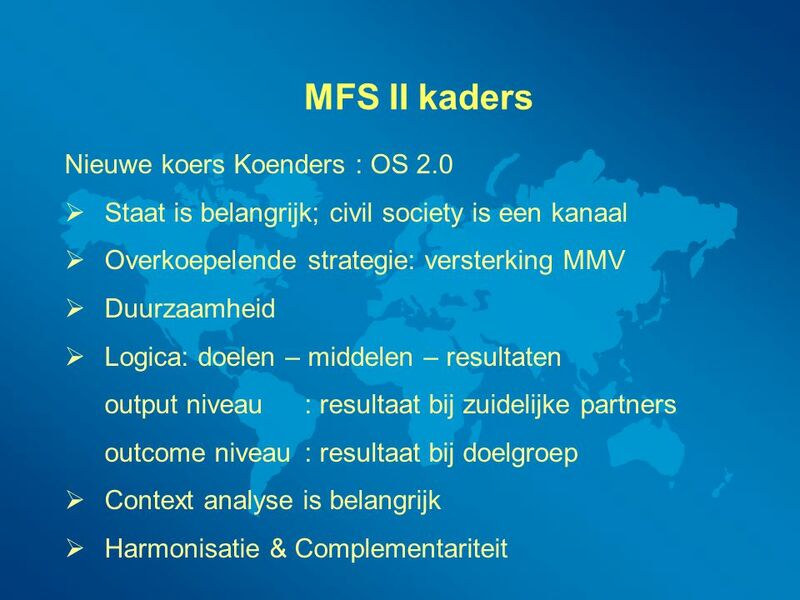 In the MFS II application, Oikos and Oikocredit are not co-applicants. 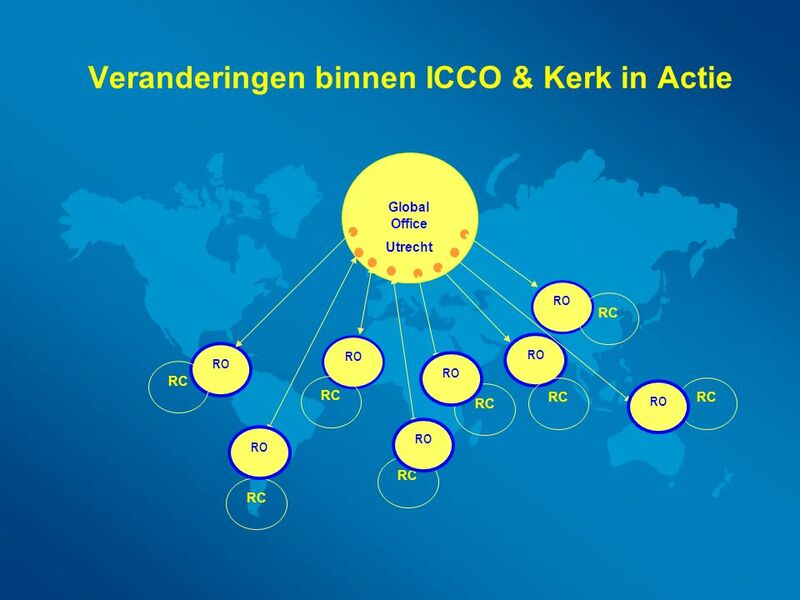 Both are however involved in the programmes of the ICCO Alliance. 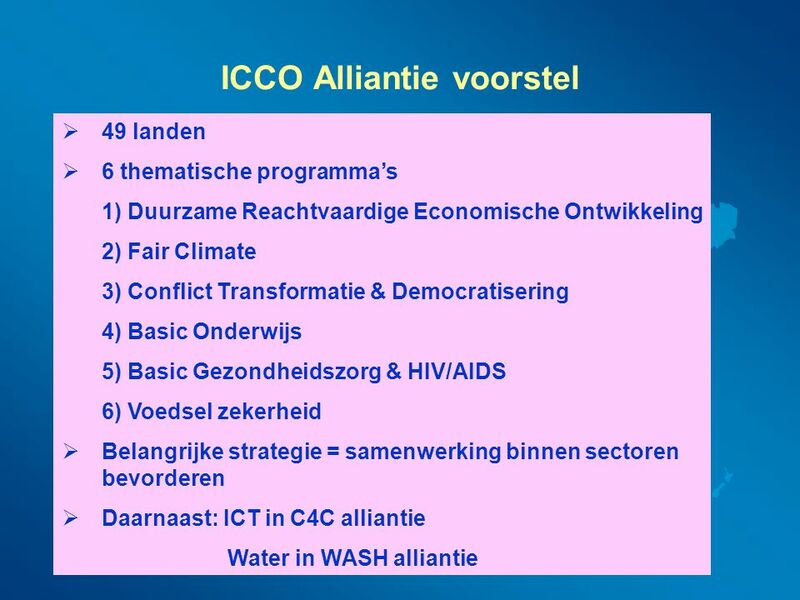 49 landen 6 thematische programma’s 1) Duurzame Reachtvaardige Economische Ontwikkeling 2) Fair Climate 3) Conflict Transformatie & Democratisering 4) Basic Onderwijs 5) Basic Gezondheidszorg & HIV/AIDS 6) Voedsel zekerheid Belangrijke strategie = samenwerking binnen sectoren bevorderen Daarnaast: ICT in C4C alliantie Water in WASH alliantie In the second phase we will work out the (thematic) programmes of the ICCO Alliance. These programmes should contain information on 7 elements. 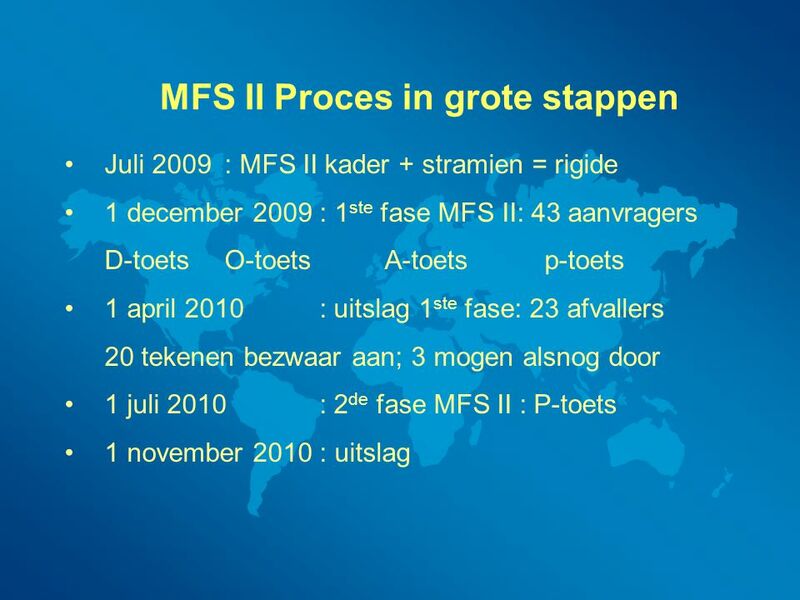 The format from the Ministry will only come available in March; Therefore we have developed a format based on what we know and what we expect. In this way we don’t need to wait till the end of March but can already start. If we receive the format at the end of March we can then see what additional info is needed. 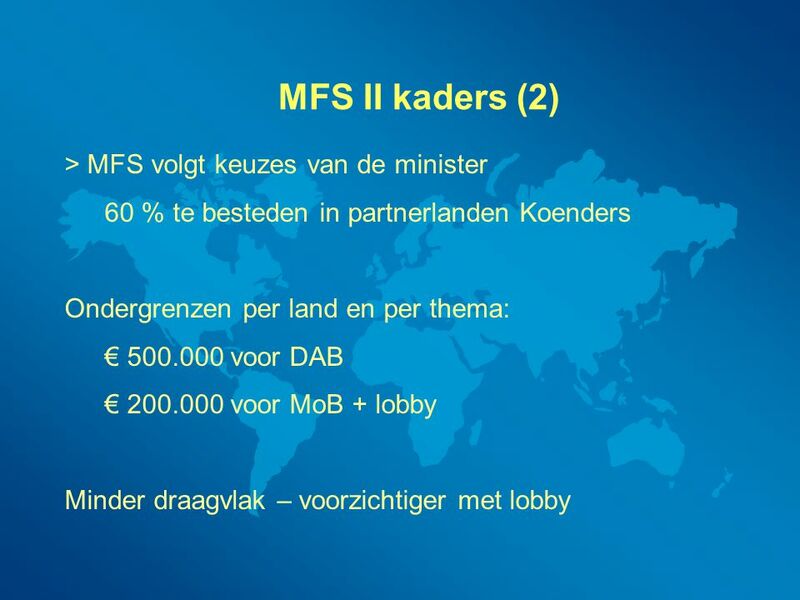 10 Uitkomsten MFS II Totaal aangevraagd 23 allianties	€ 584 miljoen / jaar Totaal beschikbaar max	€ 425 miljoen / jaar ICCO Alliantie aanvraag 25% = € 106 miljoen / jaar NB ICCO Alliantie MFS I `0	€ 131 miljoen / jaar ICCO Alliantie houdt rekening met minder The thematic programmes - for example on Food and Nutrition security - is more then the sum of the food security programme in the 21 countries. It will for in stance also look to global developments; The regional programme – for example on South Asia – is more then the sum of 5 or 7 thematic programmes. 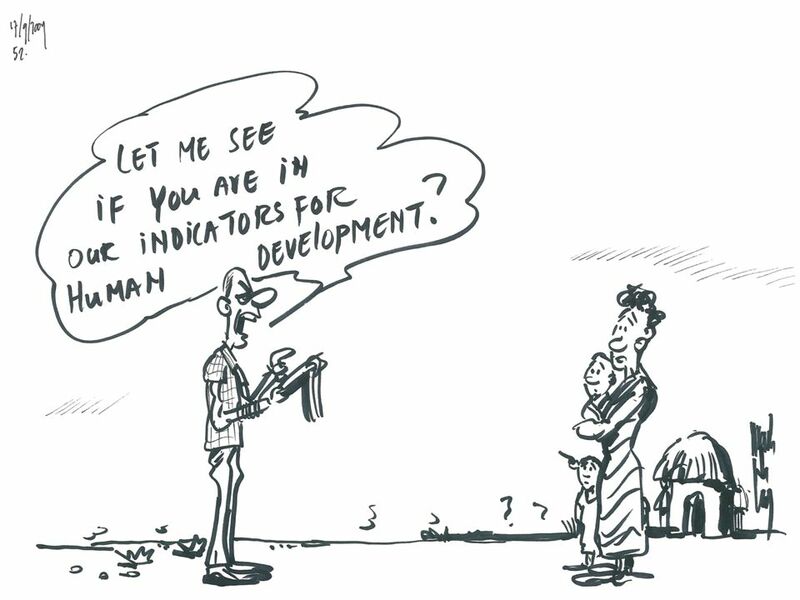 It will also look at regional trends and development and the interactions between programmes in a country or a region. 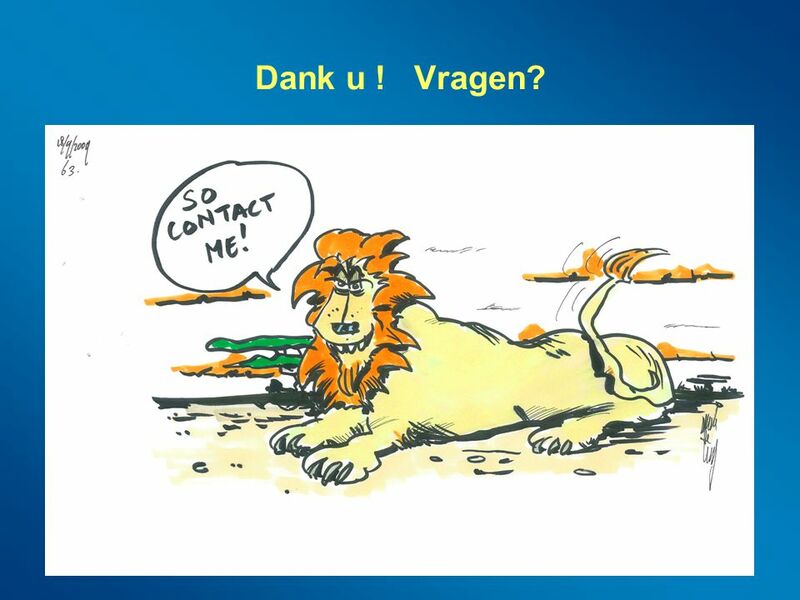 11 Dank u ! 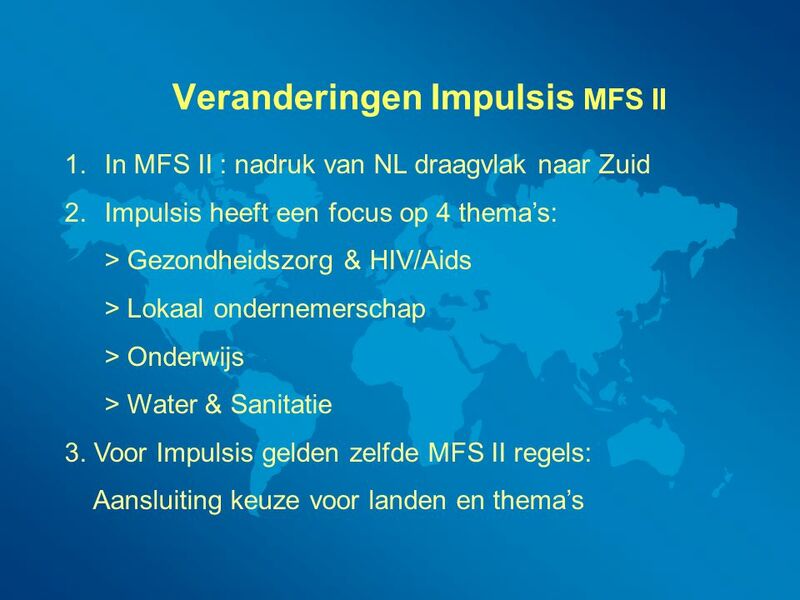 Vragen? 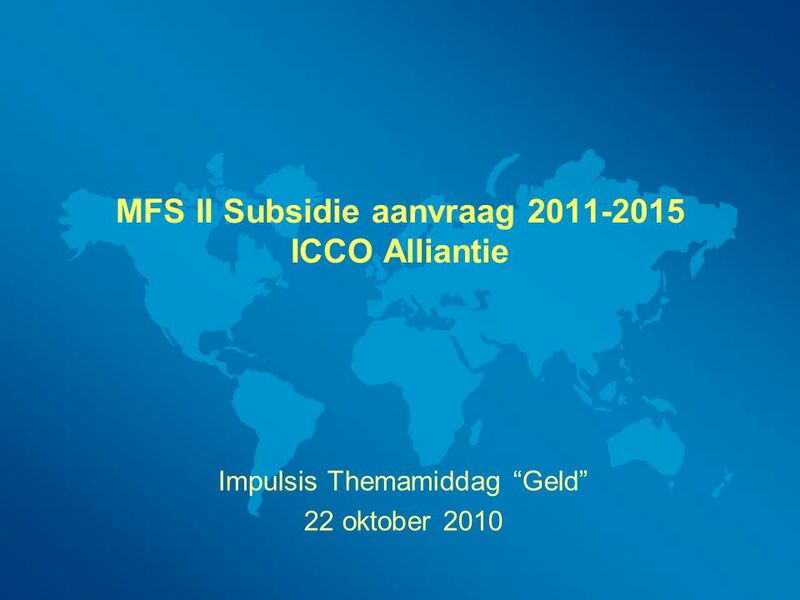 Download ppt "MFS II Subsidie aanvraag ICCO Alliantie"
Platformbijeenkomst 5 juli 2011 ESF Actie E Sociale innovatie, vitale bedrijven.